I decided to get a better flash for better portraits, and with the Godox TT350 being available for only $120 at the local photo store, I took the plunge. 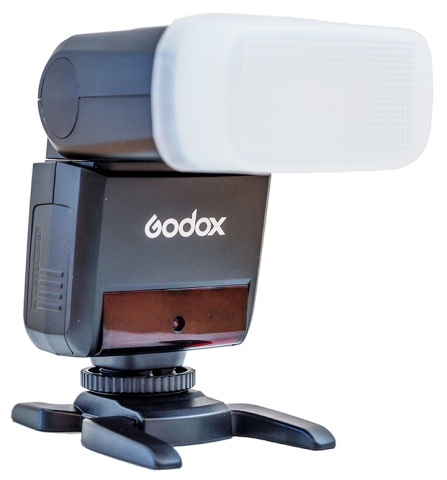 The Godox looks like just about every flash. It's compact, light, and runs on two AA batteries. The box includes a pouch and a foot for off-camera flash. Back of the flash with the LCD display illuminated. The flash can adjust its beam from a wide spread of 24 mm to a narrow 105 mm, and will do so automatically as you zoom with the lens if set in auto mode. You can also set the beam spread manually, for example if you, like me, use a diffuser and want the widest possible beam all the time. Front of the flash with the included diffuser attached. The included diffuser makes no difference to speak of. I heartily recommend getting a proper diffuser like the Puluz 45cm Round Diffuser. How does it perform then? Very well, I'd say. Compared to the built-in flash on my Nikon D600 with GN 12 m, this flash puts out eight times as much light and works great with a ring diffuser, even outdoors. 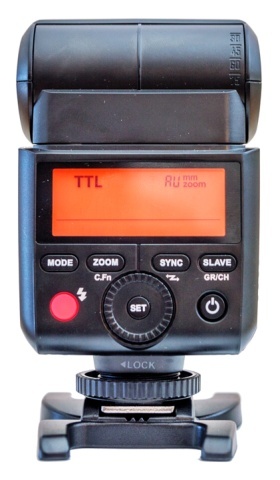 A cheap and very capable flash unit that gives a lot of bang for the buck.